People seemed to like my macro flower photos the last few days (and thank you for the comments), so I will show a closer photo of the beach than I normally photograph. I like the wavy texture and variable color of the sand at low tide on Tamarindo beach. I surmise that these patterns are made because the beach is so gently sloping, so the tide recede a long distance and slowly. On our Viva la Voyage travel photo site this week we are showing photos of two charming towns on the shores of Lake Como, Bellagio and Varenna, Italy. This surfer in this photo looks very comfortable cutting left on a small wave. I hope he has had someone put sun screen on his back, as the sun is glistening off his back. Some Americans and Canadians do not take into consideration that the sun is more intense in Costa Rica because of the location closer to the equator. People who can tolerate a certain amount of time in the sun without protection up north will be sunburned in that same amount of time in Costa Rica. I learned this lesson, painfully, on my first visit to Tamarindo in 2005. Today is Sunday, so we have new photos on our Viva la Voyage travel photo site. This week we are showing photos of two charming towns on the shores of Lake Como, Bellagio and Varenna, Italy. 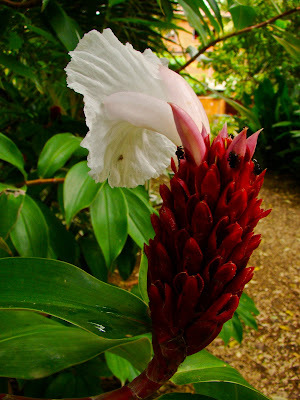 This is a close view of the interior of a ginger flower, showing the delicate features, subtle colors, and feathery texture. By coincidence, my high school debate partner, who is lawyer in St. Louis, has a ginger farm near Arenal, Costa RIca. Who would have thought that two high school friends growing up in Missouri would both own property in Costa Rica 40 years later. A month or two ago, I showed a photo of the front of this type of wild ginger flower. You can see it again here. I thought I would show a photo of the back side of the flower to show its structure. This flower resembles some cactus flowers in its shape, structure and size, as reader's of my wife's Scottsdale Daily Photo website will recognize. Julie shows lots of macro photos of flowers, particularly cactus flowers, on her site. I don't normally take macro flower shots, but I thought I take a few either because I think Julie or readers of this blog might like them. I also take macro flower shots at times when I am with Julie and she does not want to take the time or trouble to change lenses or if she does not have her macro lens with her. Here is a photo of a few of the boats in Tamarindo Bay, taken from the balcony of our condo at the Tamarindo Diria Resort. I don't know what it is about boats, but I enjoy watching the boats sail in and sail out of the bay. I find watching boat traffic is very different that watching car or truck traffic, which fortunately I cannot see from our condo. Boats gliding across the water are soothing. When gazing at the ocean, I sometimes find my thoughts drifting to the experiences and lives of peoples across the ocean. How are the people of Christchurch, New Zealand, one of the most charming towns in the world, coping with the tragedy of the earthquake there this week? Will the people of China develop greater political freedom to match the remarkable improvements in their economic standard of living and national infrastructure? What will Papua New Guinea be like when Julie and I travel there next year? One of the places across the ocean is Easter Island. It is unique. We are sharing photos of it this week on our Viva la Voyage travel photo site. Walking and relaxing on the beach offers more to watch than the waves, sky, pelicans, gulls, surfers and swimmers. At times there are dogs frolicking in the surf, such as these two dogs who are checking each other out. The dog int he foreground of this photo is looking to the southwest, and thousands of miles to the southwest is Easter Island, the subject of the photos that we are showing this week on our Viva la Voyage travel photo site. It is one of the most isolated inhabited places on Earth, more than 2,000 miles (3,000 km) west of Chile and 1,300 miles (2,000 km) from the nearest inhabited place, Pitcarin Island, to the west. This is a change of pace from the usual pictures that I post of the beach, village life, or even animals in the wild. This is a photo of a margay in the Las Pumas Rescue Center. 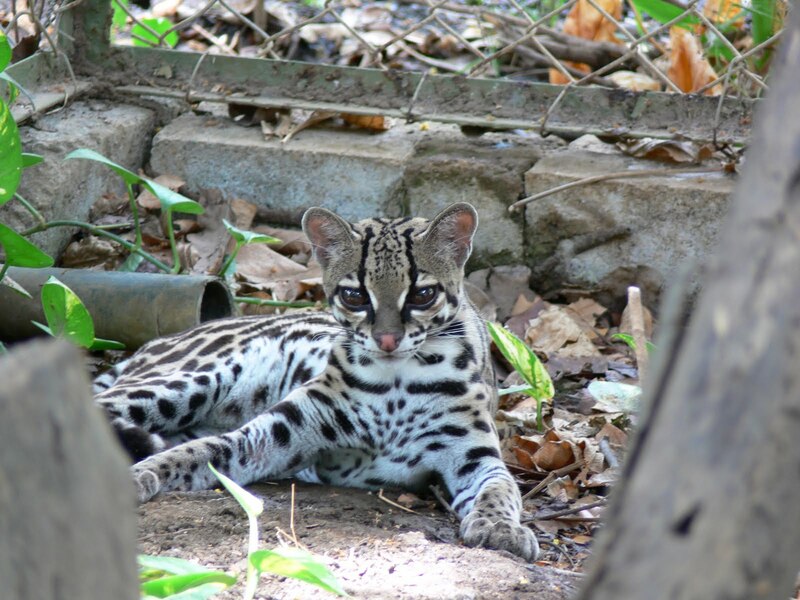 Margays are the size of a large house cat. They forage in the forest for small rodents. The Las Pumas Rescue Center is a place where animals who have been injured or who otherwise would not be able to survive in the wild are cared for and fed until they can be reintroduced to the wild. If the animals will not have a good chance of survival, they are cred for at the Center. Las Pumas Rescue Center was founded by a Swiss woman who fell in love with Costa Rica, Lily Bodner de Hagnauer. She passed away in 2001, but the Center continues her noble work. She started caring for animals, the the Center just grew. The Center welcomes visitors who are on wildlife float trips on the nearby Corobici River and also welcomes donations. We have photos of Easter Island on our Viva la Voyage travel photos site this week. I have shown some photos of some guys surfing during the last few days, so it is time for a little gender equality with this photo of a surfer girl, or perhaps it would be more respectful to refer to her as a surfer woman, although I have never heard that term. Here is another photo of a surfer on Langosta beach. you can again see the spray blowing up from the top of the curl of the wave. This surfer looks quite skilled, relaxed and comfortable as he rides the wave right at the point where the curl is about to break. Today is Sunday, so we have new photos on our Viva la Voyage travel photo site. This week we are showing photos of Easter Island, a unique place. The waves consistently roll in on Langosta Beach, which makes it a very good surfing spot. I don't know why, but people say that surfers like it when you can see the spray blowing up from the top of the curl of the waves just before they break. You can see that spray in this photo, which I took near our Langosta Beach condo. On our Viva la Voyage travel photo site we this week are showing photos of a special place, the gardens of the Villa Melzi in Bellagio, Italy. Something is missing in this photo. I think you can imagine what happened a moment before this photo was taken. The surfer in this photo successfully negotiated his wave. Tomorrow I will show a different result. The family that I mentioned yesterday who wants their two sons in their low 20's to learn to surf also said that they want to try zip lining, ATVs, and sailing. It sounds like they plan to have a very active vacation. They said that they have not taken a vacation together as a family for quite a few years and this trip is their 25th wedding anniversary and they have decided to celebrate together as a family. Here is a photo of a surfer at the tail end of a wave. I do not think he will be able to stay up as this wave catches up to him and the surf churns around him. I received an email yesterday from a couple who has just made a reservation to rent our condo at the Diria Resort for a week. They have two sons in their low 20's, and they said that their sons want to learn to surf on their vacation. I will therefore show a few photos of surfers so that they will see what they have to look forward to on their vacation in a couple of months. Speaking of vacations, on our Viva la Voyage travel photo site we are showing photos of one of the places we visited on our vacation last summer. We took 13 friends to Bellagio, Italy, on the shores of Lake Como. This week we are showing photos of the gardens of the Villa Melzi. Tamarindo is famous for turtles, but the turtles in this photo are not the type of turtles for which Tamarindo is known. Tamarindo Bay is the nesting site of the endangered Pacific leatherback tortoise. I have never seen one. My wife did a nighttime watch with a park ranger and saw lots of fire flies, but no tortoises came ashore to lay eggs. I have seen sea turtles in the ocean at Tamarindo, as I have shown on this website in the past. Today's photo of a cluster of turtles was not taken out in the wild, although I have seen turtles like this in the wild. These turtles were sunning themslves in the water feature of the Garden Plaza shopping center in Tamarindo. This week we have photos of the Villa Melzi in Belllagio, Italy on our Viva la Voyage travel photo site. Bellagio is one of our favorite places, and the gardens of the Villa Melzi are a delight to visit. Here is a close up photo of a Baruca mask. You can see that it is a busy and brightly colored collection of tropical images, with birds, leaves, branches, flowers, with a face at the bottom. Similar to the evolution of Navajo rugs, which changed in style and color to appeal to the tastes of consumers, I am sure that these masks are made so that tourists will have pleasant memories of their Costa Rica vacations. Despite the changes from whatever was the indigenous traditions from several hundred years ago, it is important to continue the indigenous arts and crafts. Costa Rica does not have as much of an influence of indigenous cultures as some other places in Latin America, such as Mexico or Peru. Sadly, the almost all of the indigenous population did not survive the Spanish colonial era. During the second half of the 20th Century, however, Costa Rica did pass several laws to set aside land and to help preserve the small pockets of indigenous people. Closer to Tamarindo, the Chorotega pottery that I have shown in the past is the primary indigenous artistic tradition that remains. This week we have photos from one of our favorite places, Bellagio, Italy, on on our Viva la Voyage travel photo site. We are featuring the gardens of the Villa Melzi. I encourage you to take a look. You will see why a Vegas Casino borrowed the name Bellagio. This is a photo of the display of Baruca masks for sale in a store at the Diria Resort complex where we have one of our two condos. 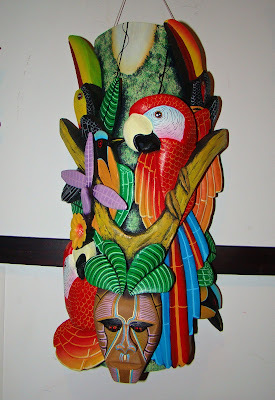 The mask are are carved from balsa wood, which has the two advantages of making them easier to carve and lighter for tourists to take them home in their suitcases. The most common traditional themes are depictions of the devil. The Baruca culture's largest festival is the Juego de los Diabolitos, or Dance of the Little Devils. Probably to appeal to the tourist market, many of the masks show Costa Rican tropical jungle themes such as toucans. Making handicrafts and selling them to tourists is the source of 80% of the income for the Baruca people. Masks are their primary craft. I will show a closer view tomorrow. Today is Sunday, so we have new photos on our Viva la Voyage travel photo site, and we have a special treat for you this week. Bellagio, Italy is one of our favorite places, and we are showing photos of the Villa Melzi gardens. This is the real Bellagio. This ain't Vegas, baby. 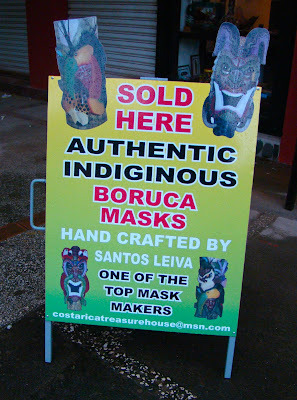 This is a photo of the sign advertising Boruca masks in front of a store in central Tamarindo. 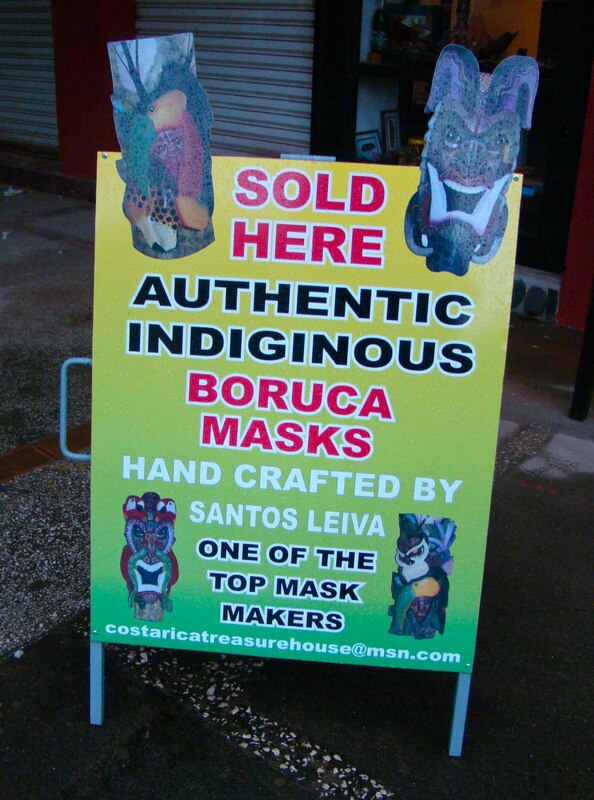 Baruca masks are the primary craft of the Baruca culture of indigenous people in southern Pacific Costa Rica. I will show the actual masks during the next few days. 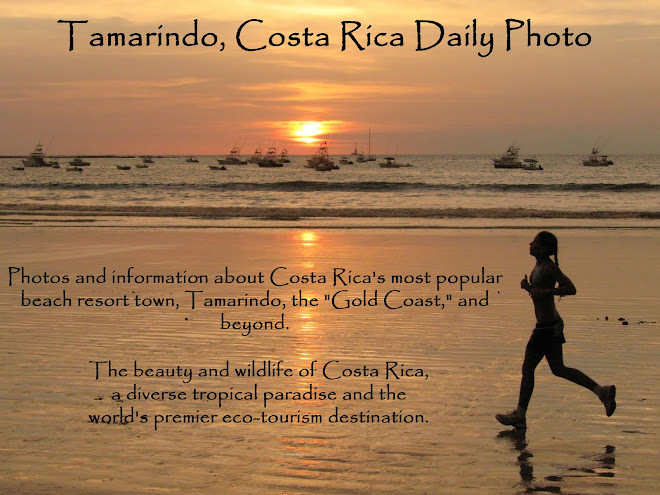 Tamarindo is in the northern Pacific area of Costa Rica. There is a Baruca reservation, although I have never been to that region of the country. Sadly, there are only about 2,000 members of the tribe, and even sadder, the language is dying. There are only a handful people who are fluent in the native language, and a small number of younger tribal members who understand the language but generally to not speak it. The loss of indigenous languages is a worldwide phenomena. I am woefully undereducated about foreign languages, like most Americans, but I understand that the loss of language carries with it a loss of culture, as some languages have unique ways of expressing cultural concepts, which is why we borrow some words and concepts from foreign languages. We have photos of the architecture of London on our Viva la Voyage travel photo site. Here is a photo of some flowers providing a perch for a butterfly. I took this photo in the gardens at our Langosta Beach condo. My wife, Julie, shows a lot of macro photos of flowers on her Scottsdale Daily Photo website, often cactus flowers taken in our yard in Arizona. I am not as skilled nor do I have much of an eye for flower photos. This brings to mind something that perhaps happens to you or other couples. My wife and I love to travel. We can spend a day together visiting some place, and when we download our photos at the end of the day sometimes it looks like we spent the day in different places. Julie will have photos of flowers and portraits of people. I will have photos of architectural details or landscapes, without any people. Here is a photo of an iguana up in a tree. You can seen him because he was on low branches where there were not many leaves. You can imagine, however, how he would blend into his surroundings on higher branches where there are lots of green leaves. Yesterday, Jack of Hartford Daily Photo left a comment about whether the iguana that I showed during the last couple of days thinks he would be noticed if he stays very still. I therefore thought I would show this photo today. There are lots of times in Costa Rica when you do not notice that there are iguanas up in the trees above you. Iguanas spend most of their time in trees. They are usually still. They can climb down into the rivers and streams and swim. This week we are showing photos of the architecture of London on our Viva la Voyage travel photo site. Here is a photo of the profile of a green iguana. I am showing this today to complement yesterday's photo of the straight on view of the iguanas face and chin. Today's and yesterday's photo show the three most distinctive features of green iguanas (besides their color). Yesterday showed the dewlap hanging down from their chin. Today you can see the large round scale hear their jaw and the crest with long, sickle-shaped scales that run down their spine. They often stay very still. They usually do not move very fast unless they are alarmed. My wildlife guide book says that the fastest that they move is when they bury the eggs a female has just laid. That makes sense. Exposed eggs would be vulnerable to lots of birds or other creatures. We are showing photos of the architecture of London this week on our Viva la Voyage travel photo site. Iguana: "Not by the hair on my chinny, chin, chin." I like iguanas. They are colorful. They interact with you by watching you and allowing themselves to be watched. They are usually still enough to allow you to get a good look (or a good photo). As you could probably predict from the photos of the last few days, the woman riding her bicycle crossed the bridge. There is a boy approaching the bridge from the other direction. There is not high drama here, but just a simple scene of village life. Costa Rica is not a wealthy country. It ranks almost 100 on the list of nations for per capita income, however its people are about 4 times more prosperous than nearby Nicaragua. Costa Ricans, even those in rural areas, are educated, with literacy rates and health care ranking equal to the USA. I was talking to a Tico who lives in a very simple house in a village without paved streets, and I asked him if he used the internet, and he answered "Of course." This is a photo of the pedestrian bridge that I showed the day before yesterday. One of my readers, Margaret, who has a very nice travel photo blog, left a comment that the bridge looked sturdy. I agree. It has concrete abutments, and is a cable suspension bridge with cyclone fencing material on each side for the safety of children. The wood slats to walk on are in good shape. With the woman riding the bicycle towards the bridge that I showed yesterday, I think you can guess what tomorrow's photo will be. Today is Sunday, so we have new photos on our Viva la Voyage travel photo site. This week we are showing photos of the architecture of London. As I got out of my car to photograph the village bridge that I showed yesterday, a woman came by riding her bicycle towards the bridge. Reflecting that people are the same all over the world, it appears that she was texting while she was riding her bicycle. This week we are showing photos from Tanzania, featuring great wildlife shots that my wife took on our Viva la Voyage travel photo site. Across the street from the house I showed in yesterday's photo is a river and this bridge. There are more houses across the bridge. Unlike the USA, where it seems everybody in rural and suburban areas drives everywhere, in Costa Rica it is common to see people riding bicycles and walking as they travel around their towns, villages and the countryside. This bridge was obviously built for people, not cars. After running a little series of surfing photos last week, I will start a little series this week of a village scene. This is a typical rural Costa Rican house in a typical village about 45 minutes inland from Tamarindo. This is not a tourist area. Most people in this area make their living from small farms or ranches, although the town of Santa Cruz, which is the equivalent of a county seat, is about 10 - 15 minutes away, so the people who live here could work in town and commute to a rural home like this. People seemed to enjoy the village series that I ran a few weeks ago, so I hope you will be interested in this series as well. Tomorrow I will show what is across the street from this house. It is not another house. I am showing this photo of a typical sugar cane field near Tamarindo to share some economic news that was in the newspaper recently. Last year sugar exports from Costa Rica nearly doubled. Costa Rica is also a worldwide leader in exporting pineapples and bananas. Coffee is another leading export crop. High technology and medical product exports now have a greater dollar value than agricultural exports, with the USA being the largest trading partner for Costa Rica. The increased exports are due in part to Costa Rica voting to ratify the Central American Free Trade Act (CAFTA), which also required that Costa Rica reduce import duties for foreign goods coming into the country. Farmers worried about imports competing with their goods forced a national vote on CAFTA and Costa Rica is the only country to approve a free trade treaty by a vote of the people. The worldwide Daily Photo theme for February 1 is fountains. I have decided to post a fountain close to home. 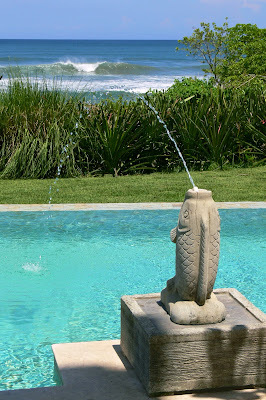 This is the fish fountain at the swimming pool of our Langosta Beach condo. As the first photo at the left shows, the beach is just beyond the pool. The second photo shows the pool with a series of the fish fountains. The fish fountains have proven to be somewhat of an attractive nuisance, as some children like to play with them, and one guest (of another condo in the building, not mine) actually broke one of them. Our property management company was able to find a replacement, although it was not easy. We do not have big monuments, parks or plazas in Tamarindo. There are only a few paved streets. 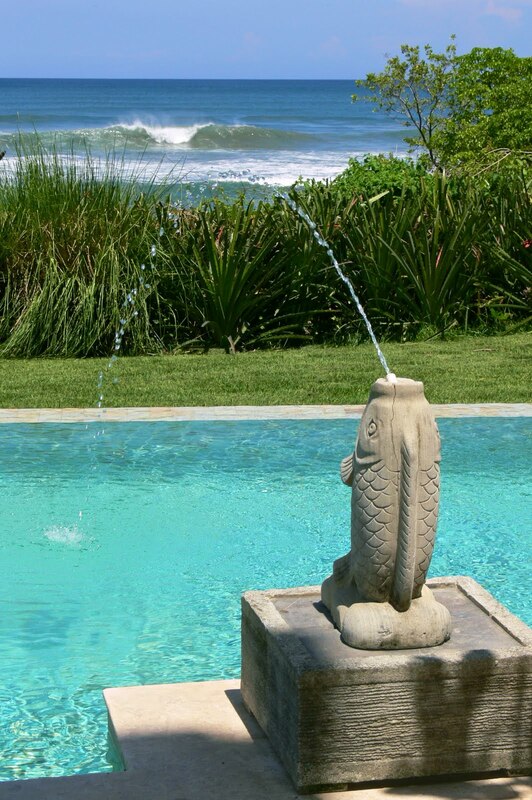 There are a few fountains in Tamarindo. All of them are at shopping centers or condo developments. I therefore decided to stay close to home and show this fountain that we look down upon from our condo balcony. Swimming pool fountains such as this have a functional purpose in warm weather. They aerate the water, which increases evaporation, and leaves the remaining water in the pool cooler. I know that in many parts of the world on Feb. 1 you do not have a problem with swimming pool water becoming too warm. This week we are showing photos of Tanzania, featuring wildlife, on our Viva la Voyage travel photo site.